The editor concludes his five-part series with a look at his early Odessa File years -- years of growth and success and personal loss. This account previously appeared on SchuyLines in 2012. SCHUYLER COUNTY, 2014 -- When I was a wee lad, I developed a propensity for writing verse. I would concoct story poems in the lower level of our split-level home in Bloomfield Hills, Michigan, seated at a school-style desk — the kind with a single armrest on the right leading to a wide writing area. I would write about gunfighters, about superheroes, about anything that struck my fancy. Most were poor efforts, I imagine, but on occasion I would create what I considered a keeper, and I would store it away. Alas, somewhere along the way my stash of verse disappeared, whether at my own hand or that of my mother I can’t say. And that’s all I recall, although I know The Fly showed up, too. It was titled “The Saga of Mr. Smeasly and The Fly.” I wrote that in the fifth grade. I subsequently wrote verse now and again across the years — it’s a creative outlet that serves to relax me — but I don’t recall any specific efforts, at least until after I had worked at The Leader in Corning (which I departed in early 1999). I created three anonymous poems shortly after that, each touching on Corning issues of the day. I sent them to a longtime Leader columnist, Bob Rolfe, who in turn printed them, pondering who might have sent them. I’m not sure if he ever tumbled to the fact that it was me. After I started The Odessa File, I occasionally wrote poems. They were usually in response to something going on in Schuyler County or nearby, and sometimes were rather pointed … bitingly satirical, even. So most of them didn’t see the light of publication. I wrote one in reaction to the seemingly obvious advantage Elmira Notre Dame, as a Catholic school that draws from more than a single district, has in recruiting athletic talent. It had to do specifically with a successful girls basketball team, and was titled “The Apocalyptic Quintet.” I don’t recall if that one ever was published. I wrote another in reaction to a failure on the part of some coaches to call me with results of their teams’ sports events. It was called “The Phone Call,” and laid out rather rhythmically my disdain for coaches who don’t call and thus fail to get their kids the publicity they deserve. That bit of verse did run, and upset its intended targets. Another that ran was about the 2005-06 Watkins Glen High school boys varsity basketball team, written after it had won its first seven games of the season. The poem was from the perspective of a distant future, its author looking back, and envisioned the team going unbeaten through the season. (They in fact went 18-0 before losing in the postseason.) The poem was titled “The Wild Bunch.” I remember one parent a little upset with that title, thinking it disrespectful, but it wasn’t long before the team had embraced the name, and “Wild Bunch” T-shirts were making the rounds. The roster included Conor Flahive, Joe Westervelt, Sam Schimizzi, Brandon Marvin, Tim Rentschler and his twin brother Brian, Jeff Meehan, Steven Combs, Aaron Thomson, Travis Phoenix, Jon Fazzary, John Michael Bianco and Pat Suits. Did something quite daring, it losing forestalled. Until there were no games to lose for these men. A Flahive, a Westervelt, Schimizzi and Marvin. Were done by the Rentschlers and Meehan and Combs. In the year of our Lord, it was two thousand six. Was it good verse? Not really, but it did catch the spirit of the season, one that ended with the team cutting down the nets after its regular-season-ending 18th victory. The players were kind enough to let me climb the step ladder and snip away, too. When I think back over the years of The Odessa File, I see it as something of a newsreel. I see myself laboring at my computer in a room on the ground floor of my house early in the site’s development. I sense the frustration as I strive to put a product out into cyberspace that will attract visitors — visitors who are slow to find it. I see myself reading occasional angry e-mails from readers — parents of athletes, the athletes themselves, or someone else upset with me for some reason — and steaming as I peruse the words. I was, at the start, thin-skinned, and tended to fire back with answers in kind. That’s not a great way to win friends. I see me debating with officials of a local public institution, stating my case, my belief that they could do better. I might as well have been talking to the wall; and in their reaction — angry, of course, for I was an outsider encroaching — I learned to be patient and to attack with kindness and reason; or, in the alternative, to stay out of their business. I see the year in which it all coalesced, and I was given various honors: a Sheriff’s commendation, a Community Spirit Award from the Chamber of Commerce, a Paul Harris Fellow honor from Rotary, and admission to the Watkins Glen High School Sports Hall of Fame. I see the athletes I have covered, and have watched grow and move on. Some are forever with me, like the players on the Watkins Glen girls varsity basketball team of the 2004-05 season, who rallied to my aid after the death of my wife on November 1, 2004. They organized a dinner for me, and raised some much-needed capital for my bank account. Kindness like that is indelible. I have prepared a message to the student-athletes of this school that reflects, I hope, my feelings on the strides they have made in their lives since we first met … and what they have meant to me personally. When tragedy struck my family on November 1st, I was thrown into a realm of despair … so thick with fear and regret and sadness … that I thought I might suffocate. Somehow … somehow I made it through a week, and then a week-and-a-half … and I was still breathing … still surviving the shock and the pain. But I was in need of something … some injection of hope, some place where I could go and feel a measure of peace. I don’t believe I thought this out … I just went with instinct … and headed for a shrine that has nothing to do with religion. I drove down to Watkins Glen, to this very Field House … where the varsity basketball players were practicing for the upcoming season. I wandered into the building unseen, and up to the track … and looked down upon the activity on the floor, where the girls were practicing. Off to the right were the boys. And I stood up there and watched, and no one saw me at first … and I wondered why I had come … and I almost left. But then a couple of the girls spotted me, and called up to me, and smiled, and waved — and a couple of others came up the stairs and onto the track and gave me hugs. And we exchanged small talk … and somehow I felt a little better. Small talk can sometimes loom very large. I ventured down to the floor and visited on the boys’ side, and talked to coach Fazzary, and was comforted by his words — words of a man who had lost a family member recently and understood the difficulty of dealing with it. And then I went back home — back to the memories — and slept soundly for the first time that month. I then related to the audience how the girls had staged that dinner for me — showed me a kindness and loyalty that I would not forget. And I talked about those two attributes, kindness and loyalty, and how they are a balancing act at the heart of sportsmanship, mixed in with determination and ability and drive and the will to win. When I started The Odessa File, I did so with some skepticism from my wife, Susan, who considered it a bit of wishful thinking and a waste of time and money. But as the effort took hold, she started thinking the website was “pretty cool” (in her words) and an outlet for one of her creative bents, which was photography. She was the chief picture-taker in the family — snapping reams of photos over the years, documenting our history to a zealous degree. She took that talent and applied it to The File, and was tickled when her photos of various events started to appear, and in particular when anyone mentioned them. She had, over the past few years leading to the launch of the website, been teaching Special Education children in their homes under contract through various county agencies — in five counties, in fact. It was a demanding job full of regulations and forms, and it wore on her. She said she found the photography outlet both satisfying and therapeutic, reducing the stress level her job created — as well as the stress that worries about her health had engendered. As 2004 unwound and I moved toward the completion of two years online, she even started reducing some of her Special Ed caseload, with the intention to shift more of her efforts to The Odessa File — including, I suspect, the business end of it. But that shift came to an abrupt stop; everything, in fact, came to an abrupt stop. A cancer that Susan had fought off with herbal treatments more than a year earlier returned with a vengeance — sneaking back in, sending tumor tendrils around her spinal column. A hospital stay lasted but a week, with Susan dying of a pulmonary embolism. The shock was intense enough — lasting enough — to make me consider folding up The Odessa File and moving somewhere else. Getting away might help, I reasoned; new experiences in, say, another state might serve as a balm. But the visit to the Field House, the dinner staged by the basketball team, and the fact that suddenly, within weeks, businesses finally started advertising on the website convinced me to stay and see everything through. From the moment I set foot in the WGHS Field House, I felt welcomed. The man in charge, high school teacher and former college football coach Craig Cheplick, had lobbied me to cover the school’s sports, to report on them on the pages of The Odessa File — which until that point was a struggling ship in danger of capsizing. He wanted me there, writing and photographing — telling the ongoing story of the school’s athletes and sports program — and the kids wanted me there, too. The first Watkins-based event I covered was a girls soccer game, which I recall primarily for the intensity of one of its young athletes, Megan Matthews — an outstanding performer in soccer and track, and a key part of a successful Watkins basketball team. She was fired up that day, encouraging her teammates, grumbling at an official’s call, playing hard. I don’t recall the outcome, but I remember that drive. And while she intimidated me a bit, the other athletes were very friendly, very welcoming. I felt that between the intensity and the warmth, this was indeed a school worth covering. Cheplick had recently taken over the athletics department, not long after the departure of an Athletic Director named Jamie Harter, who moved on to similar positions at Waverly and Corning. Chep, as he is widely known, was not officially the AD, not having the certification which the title requires, but he was, from a practical and observational viewpoint, exactly that: the director of athletics. And he had vision: he saw what daily coverage on a website could do for the sports program — how it could become a reflection of ongoing efforts that might otherwise be ignored; how it could magnify the positive. That’s why he lobbied for my services. And he was right. The stories and photos on The Odessa File were embraced by the student-athletes, and ultimately by their parents and grandparents, and enthusiasm seemed to grow there in the Field House and on the playing fields. Eventually Chep and I decided to enhance matters by instituting an Athlete of the Week award, one at Watkins and one at O-M, to further validate the kids’ efforts and successes. The idea was to pick an athlete, give him or her three points in an ongoing, school-year-long poll that would yield an Athlete of the Year, and give one point each for Honorable Mentions to what turned out to be a good many athletes. Naturally, as I should have expected, this earned not only plaudits but a few brickbats. I heard that some in the athletic program at O-M did not like the award — coming as it did from someone outside their organization and because it conflicted with their own end-of-year athlete awards given to the outstanding senior male and female athletes at their school. (I understood, but decided that the more hard-earned awards available to our young student-athletes, the better.) Beyond that, the weekly honors upset the occasional parent. One fired off several emails to me critical of various things, including my Athlete of the Week picks (which in truth were made in conjunction with Chep and in consultation, when needed, with any coach who might be able to illuminate a performance). And it bothered an occasional student-athlete. One complaint came in anonymous form from a student who said she thought that I “favored certain athletes over others.” She hoped that “in the future you consider more carefully” who was selected. I responded with an explanation of the care and consultation that went into the award and pointed out that at that point in the school year I had given Honorable Mention to 120 different varsity athletes, and that the Athlete of the Week winners had come from 11 different sports teams. I wasn’t sure whether I preferred the signed emails from parents or the anonymous one from the student. Probably neither. But I took solace in the fact that at least they were paying attention to the awards, and rather obliquely acknowledging their import. But more important was an honor Chep and I conceived during a brainstorming session in the autumn of 2005. The idea was to create an award that honored student-athletes who were not only exceptional on the playing fields, but in the classroom and beyond — who were involved in extracurricular activities that defined them as outstanding citizens. I came up with the name Top Drawer 24 — we had decided two dozen honorees would be about right for the county — and Chep enlisted former WGHS Principal Brian O’Donnell to lend us his respected name. And so it was subtitled the Brian J. O’Donnell Scholar-Athlete-Citizen Team. We had a small committee to start, with representatives from O-M and WGHS, and decided honorees could come from any high school class, grades 9 through 12, at those schools since all four grades could be represented in any season in any sport. We decided to hold a celebration late in the school year at the Watkins Glen State Park Pavilion, and to enlist several speakers. Top Drawer members would be introduced to an audience of family and friends by O’Donnell, who also would take the honorees on a walk out on the edge of the park woods, imparting some wisdom to them. To this day — and he’s done this every year since — I don’t know what he tells them. The Top Drawer committee, which started out as mostly advisory, grew in size and importance over the years. It has consisted of upwards of 20 people at a time — educators, administrators, coaches and a lay person — with voting by its members determining the team makeup. The program has proven a great success. Across its years, we have honored scores of students in a very special way, and will (I hope) continue to do so for years to come. So … in essence, Chep, after overseeing the sports program for five years — after helping to change the culture of athletics in the district — was shown the door in 2008. He was no longer involved directly in athletics, but continued in his teaching career, and is still a valued confidante to me and the leader of the Top Drawer 24 program. While I’m not about to judge the performance of either of his successors, I do know that my own golden age of coverage at Watkins Glen ended when Chep cleaned out his Field House office. No longer would I hang out there after school, discussing this and that, coming up with coverage ideas that could keep the school’s interest and excitement levels up. No longer was the Field House the shrine it had seemed to be; no longer was it a place I would be likely to go to find solace. From a personal standpoint, I consider that a shame. But Chep hasn’t been forgotten — not by the coaches he oversaw, and not by the athletes he helped. I heard recently that one coach referred to the Field House as The Chep Center. I like that. One of the strengths of The Odessa File has been its mix of columnists and regular features — such as the photography of Liz Fraboni. She popped into my life in late 2006, at a wedding I was shooting; she was a wedding guest, seated next to me at dinner. She expressed an interest in helping with The File and said she had some basic experience with photography, so I handed over an extra camera I had with me and had her start shooting right then and there. What she produced was as good as anything I was shooting, so when she followed up with a phone call a couple of days later — still expressing interest — I handed over the camera again and had her go shoot some scenics, some of the beauty exemplified by the county’s rolling hills and lakes and waterfalls. I didn’t expect much, but was surprised. What she delivered was so obviously better than the scenics I had been shooting that I encouraged her to continue, and continue she did. Over the course of the next five years, she has produced 50 groupings of stunning photos, and earned a Schuyler following. At one point plans were under way for a showing of her work at the Franklin Street Art Gallery in Watkins Glen, plans that slipped away with a change in management. But the intent was validation of her talent. Liz –a full-time nurse — purchased her own camera rig along the way, and started shooting sports events for The File, despite her heavy schedule. To put it simply, her talent continues to shine. Other photographers have joined The Odessa File effort over the years, each producing wonderful shots: Mike Stamp, Susan Bleiler, David and Liz Waite, Don Romeo, Dan and Daneen Phillips, the late Bill Bauman, and various others. The input of each has been invaluable, enhancing the coverage and quality of the website. The File has also been blessed with weekly columns from our State Senator — first from George Winner, and then from his successor, Tom O’Mara. It has carried occasional columns on Wellness by Stephanie Parente, on Schuyler goings-on by Bonnie Seeley, and on Odessa happenings by Mayor Keith Pierce — and for years now has printed a monthly column by Brian O’Donnell on Watkins Glen High School history. I have written a largely personal column on an almost weekly basis for nine years, and on 13 occasions have published offerings by a conservative writer operating under the nom de plume A. Moralis. While I tend to sidestep anonymity on The Odessa File, there has long been a place for it in journalistic commentary. Even so, many readers don’t like that veil. Thus A. Moralis — often questioning the morality and wisdom of our age — has received some criticism. But if he — or she — cares to produce some more columns, I will give them the forum I’ve provided so far, and continue to accept the anonymity. Meanwhile, it is my hope that other columnists will step forward in the future to join the current ones. And with the advent now of SchuyLines, I am optimistic that we will find some creative writers who wish to provide essays and stories on Schuyler County history, agriculture and business. Soon after my wife died, the course of The Odessa File was settled when the advertising finally arrived — one ad seemingly leading to another and then another in the domino effect Susan had predicted. By the time the ads kicked in, The File had 10,000 readers — a far cry from the 400 of its early days. Many were tuning in to read about the area’s high school sports teams, but the focus was not just sports. I had expanded into coverage of many other events based in Watkins Glen: government meetings, business achievements, religious activities, plays … whatever was going on that struck my fancy. This included, in the summertime, the weekly Concerts in the Park program in Lafayette Park, one of the earliest events covered on the website with regularity. I had seized on covering the concerts from the outset, reasoning that they were attended by not only Watkins residents, but folks from all over the county — all potential website visitors. While I have wavered over the years in the consistency of my concert attendance, it is still a staple of my summers. In shifting the focus of coverage to Watkins Glen, I started attending Village Board meetings there, at the expense of Montour Falls Village Board meetings — sessions which I had been covering but which were held on the same nights as those in Watkins. And in attending WGHS sports events, I necessarily lost a little focus on my O-M coverage, although the goal has always been to carry a report on every contest at both schools. That requires a lot of shooting time, but also requires calls from coaches regarding road games I can’t reach, or home games I can’t attend to their conclusion. Most coaches — a vast majority — have been great about providing such information, but some haven’t been. When the calls don’t come and I thus lack the needed information, the kids end up basically ignored — and in danger of missing out on points in the Athlete of the Year race. I have yet to understand a coach who behaves that way; calls should simply be part of his or her job. But as I said, a vast majority of them have been marvelously cooperative. I have, across the years, tried to plug physically and mentally into what is going on in Schuyler County. I have learned the personalities, the politics, the trends. From the outset, I have met some of the most interesting people I have ever encountered. Two come to mind instantly: School Superintendents Carol Boyce of Odessa-Montour and Dr. Mary Ellen Correa of Watkins Glen. Both were strong leaders of their districts, both had their own styles, and both eventually ran afoul of their School Boards enough to make departure their preferred choice. I recall Boyce vividly because she was the first community leader I encountered. I had covered a basketball game and found a portion of the stands taped off behind the O-M bench — seating there thus prohibited — and inquired why. A proctor told me it was because of some unruly fans at a recent game. I had never seen stands taped off before, and took a picture, and published it — and ran afoul of Boyce, who didn’t like the publicity. But I took the incident as a potential advantage, and met with her, and it didn’t take long for us to reach a meeting of the minds. In time, we found we had common ground of a sort: She was a cancer survivor, as was my wife. Boyce was a strong-willed woman, intelligent and ambitious. I found her to be intuitive and inquisitive. We had many conversations about school life and life in general, and she rather openly confided in me. So I considered it a personal loss when she left for another similar post — another superintendency — to the east. Her successor was James Frame, an Elmiran who had come to O-M as its high school principal by way of a district north of Albany. His tenure as principal wasn’t long; he was appointed superintendent with dizzying speed by the School Board after Boyce’s departure, and has — as of this writing — been there since. Correa was entrenched at Watkins Glen when I started The File, and I didn’t meet her until a year or so later, the delay a result of my failure to start coverage of her district until after Cheplick had urged it. We had a healthy respect for one another, and she always seemed to make time to talk to me when I had questions. The year after my wife died, Correa found out I had no plans for Thanksgiving, and graciously invited me to share dinner with her and her husband and a couple of friends at her home overlooking Seneca Lake, up near Burdett. I thought that was one of the kindest gestures I had ever known, and I count that meal and the camaraderie of the day as among my fondest memories. Her successor at Watkins Glen was a person with a far different, less imperious temperament: Tom Phillips, an Elmiran (like Frame) who arrived in the Glen after a stint as a Middle School principal in the next county north. He was, in his early days as superintendent, as open as Frame was careful, as exuberant as Correa was deliberate. We initially developed a rapport, but that has been strained by coverage of his administration. He first took issue with a column written by A. Moralis that questioned the wisdom of having an educator instead of a battle-tested business executive at the top of a school district in an economically challenging time. No, I did not write that column; I am not A. Moralis (as some people have suggested). I do not think I ever would have come up with that column’s concept, either. But I defend the right of A. Moralis to have done so. The first digital camera I used on the website was a small, fairly useless one I had picked up as the digital age was dawning. It was unsuitable for action shots — in fact anything I shot that moved was blurred. So I reached into my wallet and spent $240 on a Kodak camera that was a vast step upward in quality, but still fell short on sports photography. I was limited as to what I could shoot. Interior action shots were impossible; exterior ones were hit-and-miss. And so finally, a year or more into the grand experiment called The Odessa File, I convinced my wife to let me spend more money — I think around $700 — on a Rebel camera by Canon. I selected Canon because I had some lenses from an old 35-millimeter Canon that would transfer to the new unit, including a large fixed lens. I first used that digital camera and lens at an O-M football game and was astounded when — from halfway across the field — I captured an image of my football-playing nephew Chris Bauman leaping high to block a field goal attempt. I somehow managed to snap the shot at the instant at which his big right hand was literally striking the speeding ball. From that moment, I realized that sports photography was largely about the equipment, with some tenacity, patience, anticipation, timing and luck thrown in. Susan used that camera a lot, as it turned out, photographing the Concerts in the Park and various stories she happened upon, and in fact probably did better with it than I did. But I learned how to improve my use of it, and after Susan’s passing — and after the advertising kicked in and I could afford it — I invested in a 70-to-200-millimeter zoom lens with a built-in stabilizer that opened up new vistas of shooting for me. With its rapid zoom capability, it gave me flexibility on distances, and with its relatively “fast glass” — capable of quickly taking in an image and absorbing, calculating and recording it — it gave me flexibility of locale. I could now shoot comfortably indoors without using flash. That flash usage had been an occasional issue early on; some coaches didn’t like lights going off in the faces of their players, and I can’t say I blamed them. As one camera body died, I picked up another — a step up in model and cost — and when that died, I both sent it in for repairs and purchased another, better model. This went on annually for awhile, until I built up a supply of four or five cameras, handy when I employed a shooter who didn’t have his or her own rig. That’s what happened with Liz Fraboni at the outset. She was using one of my lesser cameras, but producing stunning scenic photography anyway. When she bought her own Canon equipment, her shots were even better. And I — as most of us can when given the right circumstance — improved my shooting from something approaching lackluster to something fully functional. I’ve never considered myself a shooter, though; never a true photographer. I haven’t the knowledge nor the passion to understand the more advanced techniques, nor the artistic prowess that great shooters possess. I’ve always been, in my mind, a writer — or at best a photojournalist, with an emphasis on journalist. And thus I remain. I found along the way that the quickest way to get into trouble with some readers was to express myself in print on matters political or having to do with the dreaded M Word: merger, meaning that of the two school districts most prominent in the county. I wrote a column taking the Odessa school district to task for its merger fears after it rejected an overture from the Watkins Glen district to join forces for an Indoor Track Team — a sport rather inexpensive to mount, and for which an anonymous donor had promised $1,000 in start-up funds. It seemed to me a no-brainer: an extra outlet for athletes who might otherwise languish during the winter months. It has proved successful at Watkins, and is still not on the list of available sports at O-M. That column riled some folks at the Odessa school, and a letter I ran anonymously in conjunction with it was the icing on a bitter cake. It took the school district to task rather ungraciously; if I recall correctly, the letter also did a little name-calling. In truth, I should not have printed it without the author’s name; that was a move running counter to Forum etiquette. I chalk it up now to Live And Learn, and hope not to make the mistake again. I also ran afoul of some O-M district residents when I wrote a column explaining that I would be voting for two men running against two women in a School Board election primarily because the board, at that time, was all-female. I believed, and believe, that any governing body is best served when it has a mix of genders. I point to the current makeup of the Watkins Glen Village Board (all male) as an example of a poor gender situation. There are other such boards in the area, I imagine. In the case of the School Board election, my most vivid recollection is a venomous, anonymous email I received from a young woman — it didn’t take me long to figure out who it was — comparing me, generally, to the most vile men in history. She said I was a disgrace and should apologize to womanhood in general. As it turned out, the two men were elected, while one of the women (an incumbent) who lost was reappointed immediately to the board upon the resignation of another female seat-holder. So both genders were served. But I generally try to avoid such controversy. It only detracts from what the focus should be: the news going on in this beautiful, always interesting county. When I first visited here, back in the 1970s, I had no idea I would end up a resident, let alone one of thirty years duration. I was here to visit a pretty young woman. Since she was clearly capturing my heart, I might have had the foresight to recognize the chance that this would, indeed, be the place where I sank my roots. Thinking back, I realize my first stop in Schuyler County that day was at the Country Cards gift shop run by Susan’s mother — literally within view of the house Sue and I ultimately bought, the house where we raised our family, the house where I mourned, the house where I wrote my novels and created The Odessa File, and the house where I am writing this. Operating The Odessa File has been a roller coaster ride, full of strange twists and unlikely turns — who could have envisioned success with such an unpredictable, untested venture? — and of failures and successes. It has been a ride of missteps and sure steps, of poor judgments by me, and some fairly intuitive ones. It has been a ride unexpected and hard-earned, a journey of reader acceptance and reader rejection. And it has been worth the effort. I was speaking to a friend recently, and in our conversation we discussed occupations and the motives that drive people toward those careers they select. Sometimes the course followed is the only one available; sometimes it is born of desperation; sometimes it is for the money; sometimes it is for the love of the craft, whatever the craft might be. I think all of those reasons played into my decision to develop and operate The Odessa File. I needed work, and had no other reasonable options. If not desperate at the outset, I was pretty much so following Susan’s passing. After the advertising kicked in, I stayed with the job for the monetary potential — it’s never been great, but enough to live on. And I pursued it from the outset because I have always loved the art and philosophy and rhythm of news gathering and news dissemination. “I don’t know,” I told my friend, “I think maybe I also do this ... because it has something to do with public service. Because that’s what this is, really.” While that sounds a little haughty, a little full of myself, I think there is a ring of truth to it. I’m not speaking as a man overly proud of what he has created, but justifiably thankful for the opportunity. I have always believed in the public’s right to know, and I have — to a degree — provided at least one window through which folks can observe the passing scene. I am astounded that the technology exists by which I can effectively manage such an operation virtually by myself, and in the process reach people in every state in the union and in more than 100 countries or territories around the world. The tracking system I utilize shows that we have readers in all of those places — in some cases folks from here who have discovered a way to reconnect with their old hometown, and in other cases servicemen and servicewomen keeping tabs on what’s happening back home. I hear on occasion from such people, and am aware of two occasions where out-of-state readers got homesick by reading about Schuyler County on The Odessa File and decided to move back here. I only ask of them that they not blame me if things go sour. I don’t know how long I will continue operating The File. I am not, as they say, getting any younger. But if nothing else exciting presents itself — and I certainly don’t anticipate it — and if my health holds up (never a given), then I will continue for a long time, I hope. I was asked once by a female high school student how old I was. This was about seven years ago. I told her I was “as old as dirt.” Well, with any luck, I will be asked the same question by another high school student in ten or twenty years, and I will be able to give the same answer, and be even closer to the truth. In the meantime, I will try to keep moving forward, going to events, taking pictures, editing press releases, encouraging young writers, applauding older ones, enjoying the achievements of our young student-athletes … and writing. Let me tell you a story — a true one — about a trip I took to Watertown, New York about four years ago, a journey to visit old friends there. I had worked at the Watertown Daily Times throughout the 1970s, before leaving my job to travel the country and see where the road led. 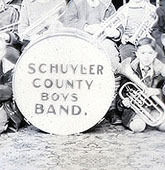 As it turned out, it led back to New York and ultimately to Schuyler County. I had kept contact with journalists at the Daily Times frequently in my first years away from there, but then only sporadically. At the time of this visit, it had been probably ten years since I had set foot in the Watertown newsroom. Things had changed over the years. The old owner-publisher, John B. Johnson, had died, and his sons had taken over. One was John B. Johnson Jr., who had been managing editor when I worked there, and was now publisher. Only a handful of reporters and editors remained from my Daily Times days, but when I entered the newsroom, they greeted me warmly. Two of them were men who had been ushers at my wedding. After visiting with them, I stepped into a side office where the newspaper’s editorials were fashioned, and said hello to one of the two men working there — someone I had known for several years about three decades earlier. “Hey, Francis,” I said, and he looked up and stared. There was no recognition in his eyes. Francis?” I repeated. “It’s me, Charlie Haeffner.” He continued to stare, and I shook my head. You don’t remember? I worked here back in the ’70s.” He shook his head. And I walked out of his office, shaking my head. I glanced back, and he was looking after me, still a vacancy there. He really didn’t remember. “Wow,” I said, and headed down the hall. There was one more person I wanted to say hello to: the publisher. But now I wasn’t sure if I should. Could I handle another blank stare? I had seen John B. Johnson Jr. more recently than I had seen Francis — about 10 years before instead of 15 or so. Maybe the five years difference would be telling. I didn’t have much time to debate myself, though, for my legs were carrying me quickly down the corridor to Junior’s office. I hesitated outside the door, which was slightly ajar. I knocked gently, heard a voice say “Come in,” pushed open the door and looked in. John Jr. was seated at his desk, leaning back, studying proposed syndicated column material — mail from someone looking to sell him something to use in the newspaper. He glanced up for a second, smiled, and looked back at the material in his hands. “Charles,” he said, for that is what he had always called me, “you’d appreciate this.” And he started explaining the mailed proposal, although I wasn’t listening. I was as stunned by his nonchalant greeting — as though he hadn’t seen me for an hour instead of for 10 years — as I had been by the blank stare of Francis. When he was done talking, he invited me to sit down, and proceeded to ask what I had been up to. He was particularly interested in The Odessa File — the fact that I was still involved in news. It was, all in all, a gratifying visit. That always makes things easier for me, when people know who I am and what I do. But there are a good many area residents who still have never visited the website — indeed have never heard of it. I find that regularly. An elderly woman who encountered an early-morning problem recently at her Odessa home — a boiler blast that required evacuation and a response by emergency personnel — was wandering around outside, still in a bathrobe. She was very talkative, very animated while waiting as the officials examined her home. She didn’t seem the least bit suspicious of my camera, until I asked her if it was okay to use her image on The File. I had figured she knew who I was since she lives not far from me. I recognized her; had seen her around from time to time, and figured she would have recognized me, as well. But she didn’t. “Never heard of him,” she said, leaving a rather awkward silence …. and leaving me chuckling at myself, at how quickly ego can be deflated. It was such a heartfelt response by the woman, such a true one, that I nodded at its definitive nature, its finality. I hope that through my website — through my words and photos and those of the columnists and photographers who contribute to it — I have made and will continue to make the people of Schuyler County feel something about the place they live, a place unique in its beauty, a place of great potential and, I think, a place of great promise. I hope I have conveyed and will continue to convey the feeling that I personally have about Schuyler County, a feeling that has grown in me across the years. It is a feeling of warmth, as though the hills and lakes were wrapped around me in a loving embrace. It is, quite simply, a feeling that signals in me a single word: Home. For Part 4 of this series, click here.